Mr. J. Krishnan, Partner, S. Natesa Iyer & Co. I congratulate you for a fantastic conclave. Mr. Joseph Valanarasu, Managing Director – South - India, Aviation Solutions India Pvt. Ltd. I take this opportunity to appreciate your whole team in making the award function a grand success. Once again thanks for you and your team for organising such a wonderful award function where you are recognising the whole industry. I just wanted to thank you from the bottom of my heart for the excellent and professionally managed event that we witnessed on the 14th of Dec. Besides the function we were able to network with a whole lot of people during the Cocktails and dinner session making it very useful. My thanks to all the team members of EXIM who were both in front and behind the scenes. Look forward to more events from the EXIM group catering to Aircargo. Mr. B. Govindarajan, Chief Operating Officer, Tirwin Management Services (P) Ltd. I must say that the event was well organized and managed with absolute professionalism. Thank you and your team for the hospitality extended. I am sure that the success of this event will certainly prompt you to hold in other regions as well. Thanks again for all your kind coordination and hospitality. Mr. Suresh Pillay. RA, President - Corporate Business & Coordinator, NTC Logistics India (P) Ltd. 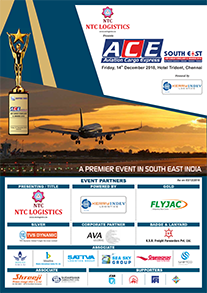 I would like place my sincere appreciation to you and your team for organising ACE-SOUTH EAST AIR CARGO CONCLAVE AND AWARD in a fabulous way. First time in Chennai we were able to witness top officials from Airport Authority of India / Customs / Airlines / Agents / Shipper in the same forum, it was stupendous effort to bring the trade bodies together. We express our immense pleasure and thanks to you and your team for organising this event. Ms. Gita Menon, Regional Director, Global Aviation Services Pvt. Ltd. I would like to place on record the excellent arrangements of the event. The choice of speakers/panelists were of high quality. I would also like to commend on the excellent compering of the event. The presentation was very good.